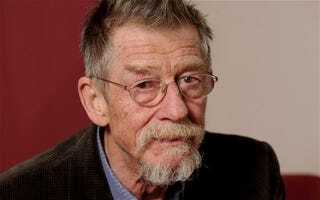 Sir John Hurt, has died aged 77 after battling cancer. The actor had recently battled pancreatic cancer but in October 2015 was given the all clear. Various sources have reported Mr. Hurt’s passing. One of his most famous rolls was playing Kane a crew member of the Nostromos in the brilliant sci-fi/horror classic Alien. There’s also his masterful performance in The Elephant Man as he embodied real life man deformed at birth John Merrick. There are too many great performances by this truly accomplished man. This was a surprise for me. And saddened. In July 2015 he received a knighthood, and said he wished his parents had been alive to see him presented with the honor. Hurt is survived by his wife of 12 years Anwen Rees-Myers.